We are pleased to present our spring 2012 issue of evolution, a seasonal journal. This issue focuses on Campus and Community. As globalization, technology and culture accelerate the transformation of our society, universities are exploring ways to respond to contemporary needs while sustaining the great legacies of higher education. Key to this exploration is how universities improve their physical environments while expressing and supporting their core values. Most institutions support a process of continuous analysis and experimentation with curriculum, pedagogies, student life, and their physical environment. As architects and planners we participate in this dialogue, helping them to realize their missions through the experience of their buildings and landscapes. Every campus is unique. In this article we highlight two recent examples of transformative projects at exceptional institutions. At the MIT Sloan School of Management, a core transformation involved the creation of a vibrant social and academic heart for a school that had been distributed in nine locations. Central to the new building, a two story gallery links two historic buildings and becomes the vital focus of School life. The gallery functions as both PATH, linking movement from multiple locations, and PLACE, a flexible center for diverse kinds of interaction. On any given day, the gallery is used for study, dining, meetings, and special events. It is designed for flexible reconfigurations. It physically links many programmatic aspects of student and faculty life: classrooms, group study, student organizations, faculty offices, administration, and outdoor gathering places. It connects to the City of Cambridge to the north, to the Charles River to the south and to historic buildings to the east and west. Important to the transformation and future of learning, the building embraces new technologies to enhance the student and faculty experience.Technology-enhanced classrooms depart from traditional inward looking rooms to become dynamic teaching spaces linked to the world. These classrooms have been designed for flexible configurations to accommodate evolving pedagogy. The building and site have been designed using a process which optimizes for high performance of integrated building systems. After a year of monitoring the performance of the building, the new MIT Sloan project has proved to be the greenest building on campus. The early integration of systems, pioneered during the design of the building, has since been adapted as campus policy for all new projects. The success of the building is reflected in a strengthening of community, which has in turn enhanced collaboration and innovation within the school and campus. The building's technological innovations express and extend the culture and mission of the school. Speaking of MIT Sloan's new building, Dean David C. Schmittlein remarked that "its use of sustainable technology in both construction and operation is consistent with MIT Sloan’s emphasis on sustainability as good policy and good business." The University of Virginia’s undergraduate program now enjoys spectacular ratings for Best Value: “second in the nation” among public institutions, according to the Princeton Review. Interestingly, the quality of the campus as a place holds no direct position among the Princeton criteria, even though Virginia has what may be the most famous original college setting in the country. Virginia’s approach to undergraduate learning has a simple but profound philosophical basis: students are treated like adults. They hold collective responsibility for a high standard of behavior through the school’s long-standing Honor System. Pedagogically, students are held to be responsible for their own educational progress, to be the masters of their own fate. This approach is enhanced by the college's student-faculty ratio and small class sizes. Informal and indoor/outdoor gathering places are extremely generous as a proportion of ‘programmed’ spaces (classrooms, and seminar rooms). With faculty offices and classrooms arrayed in two 4-story wings, the plan of South Lawn looks like a set of townhouses joined together. At each floor of each wing short rows of faculty offices are spliced together with small classrooms. At the middle of each wing open lounges, linked by an open stair, give students a 24-hour living room at the center of each discipline’s faculty workplace. At the head of the plan, joining the wings, a main pavilion with a large lecture hall, a three-story commons, and a cafe brings the overall student/faculty community together, offering chance encounters as they move in and out of the complex. Moore Ruble Yudell is proud to announce the election of principal Krista Becker to the AIA College of Fellows. Krista has advanced the design of U.S. Embassies Worldwide, through her mastery of this unique and challenging building type, creating safe, functional and inspiring places for the conduct of diplomacy. 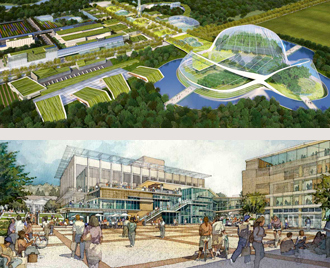 Moore Ruble Yudell has been selected to design the Master Plan for the Chinese Academy of Science, Shanghai Advanced Research Institute. This entirely new campus includes Schools of Creative & Digital Arts, Information Technology, Life Sciences, Material Sciences, and Management. The Grangegorman Masterplan is a recipient of the 2012 AIA National Honor Awards in Urban Design. The Award will be given during the AIA National Convention and Design Exposition in Washington DC on May 17-19, 2012. Designed by Moore Ruble Yudell, the main Santa Monica Library has been highlighted by the Santa Monica Daily Press as a model sustainable building. The LEED Gold Certified Library includes an inverted roof and underground cistern to collect water for irrigation. We are very happy to announce our selection with Lee Burkhart Liu for the proposed Master Plan of a community-oriented, mixed-use health campus at the LA County / USC Hospital. This is a major planning and design effort for a new center of health services, education, community recreation & fitness, housing, and research campus. 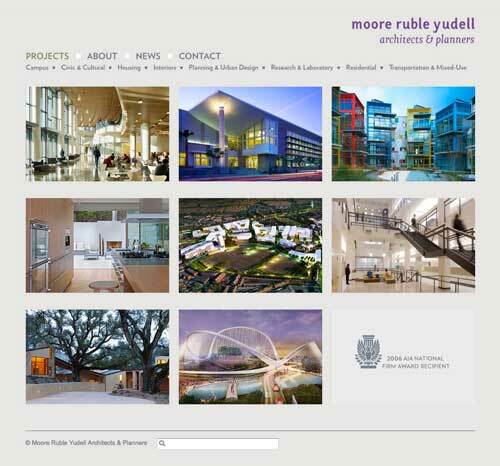 Moore Ruble Yudell has begun work on the site selection process for the new Santa Barbara Courthouse. The new building will be located adjacent to the historic Anacapa Courthouse where it will play a significant role in the heart of downtown Santa Barbara. Moore Ruble Yudell's 100% Affordable Housing Project for the Community Corporation in Santa Monica has started construction. The project is scheduled for completion in March of 2013. Santa Monica Village, a mixed-use residential and retail development in the heart of Santa Monica’s Civic Center, recently started construction. The 325 unit project is planned to be completed by December 2014. The new Two Integrated Teaching Building, at Chinese University in Hong Kong, is currently under-construction. This dynamic addition to the campus will meet a large influx of students due to a change in China’s educational system. The project is on-target for occupancy in the Fall of 2012. The John Brooks Williams Natural Sciences Center South at St. Edwards University breaks ground on April 12, 2012. The new facility will open in 2013, transforming the university's advanced program in mathematics, physics and computer science. Moore Ruble Yudell and BNIM helped celebrate the groundbreaking for the project on March 8, 2012. The two architectural firms are working in close collaboration on this innovative project. The building will further elevate the Bloch School as a world leader in business education thanks to the extraordinary philanthropic support of Henry Bloch. Perched on the 52nd floor, this "Urban Nest" recently completed by Moore Ruble Yudell, is a two-story 6,000 SF penthouse at L.A. Live Ritz-Carlton Residences. The residence commands stunning 270 degree views of the Los Angeles skyline. SCUP 2012 Pacific Regional Conference, Stanford University, California March 25-28, 2012. Leadership in the Pacific Century—The Agricultural Eco Valley Master Plan, China. Principal James Mary O'Connor, AIA, described the net-zero-carbon Eco Valley project with co-presenter Agricultural Economist Colin Carter, from UC Davis. Principals Mario Violich, AIA,ASLA, and Jeanne Chen, AIA, led a discussion bridging the diverse perspectives of the student, institutional and design team partners for the new UC Berkeley Student Community Center. The session explored methodologies in managing and shaping diverse student leadership, which can serve as a catalyst for innovative planning. Principal Jeanne Chen, AIA, participated as a juror for the bi-annual AIA San Joaquin 2012 Design Awards Program which convened in January. The program recognizes the exemplary architectural design by SaValleyn Joaquin Valley architects and for work built within the San Joaquin . In February, Senior Associate Bob Dolbinski, AIA, participated in a panel discussion of “Five Great Spaces of Justice Architecture” as part of the AIA, Academy of Architecture for Justice/ Bay Area program in San Francisco. Other firms participating included SOM, AECOM, NBBJ, and RossDrulisCusenbery Architecture.